While our dreams were dashed of seeing Suspiria at TIFF ’18 with Venice getting a coveted Premiere, patience pays-off as this latest effort from visionary Luca Guadagnino (Call Me By Your Name, A Bigger Splash) casts its spell over audiences right as the skies dim on the year, not unlike the Film’s signature muted tones. A Remake of the 1977 Italian Horror by Dario Argento, Guadagnino’s passion project sees the light of day finally after some delays getting off the ground. The Film set in 1977, centers on aspiring dancer Susie Bannion (Dakota Johnson) venturing from her humble Mennonite beginnings in Ohio to making her mark at the Marko Dance Academy in West Berlin. One of the Academy’s star dancers Patricia (Chloë Grace Moretz), disappears suddenly after revealing to psychotherapist Dr. Josef Klemperer (Tilda Swinton) the witchcraft taking place at the school. Susie arrives with great potential, catching the eye of instructor Madame Blanc (also played by Tilda Swinton). As Susie is groomed for success as a lead dancer, Dr. Klemperer warns Sara (Mia Goth), Susie‘s closest confidante, that her school is run by a coven of witches, which initially she fails to believe until seeing it for herself. It may however, be too late for Susie, whose fate has been decided upon in being transformed into a vessel for the school’s head matron, Mother Markos. A vast majority of Suspiria is spellbinding until late where it falls apart. What keeps us invested is chameleon-like Swinton as a tortured soul in elderly and widowed Dr. Klemperer, but she is even better as the commanding Madame Blanc. She manages to invoke fear and terror through few words and action as the latter. That being said, Dakota Johnson’s Susie truly is impeccable, handling the physicality of her role convincingly. She is mysterious and never gives away too much, a pristine canvass on which Guadagnino projects his art. Also noteworthy is Goth as Sara, transforming from whimsical to haunting. Radiohead Frontman Thom Yorke‘s minimalistic Score complements the feel and look of the Film perfectly. We feel at every turn evil is lurking and that continually things will take a turn for the worst. And they do ultimately. As the graphic Horror it primarily is, the Film is compelling and riveting. We cannot unsee some of the horrifying images we are subject to and felt a deep sense of terror. A tonal shift dealing with a concurrent Plotline of Holocaust survivor guilt in Dr. Klemperer‘s mourning wife Anke (played by the original Susie, Jessica Harper) isn’t developed quite as well, nor is it connected well and clearly to the main Plot. And because of this we see it as a distraction. 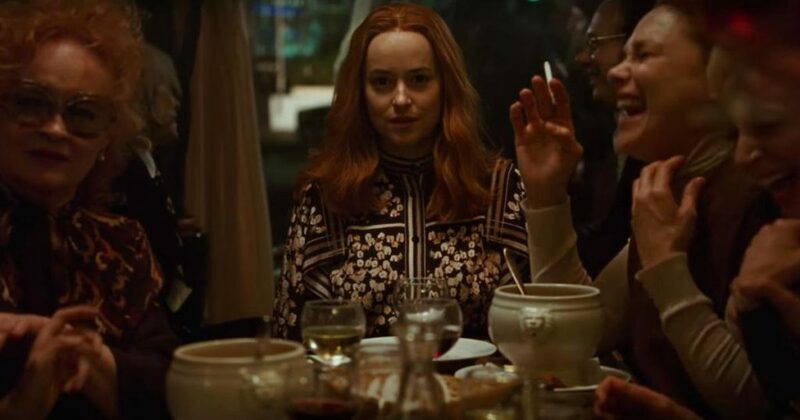 Suspiria is divisive and we see exactly why. That being said, we cannot stop thinking about it and the way it made us feel. ABMO release SUSPIRIA Friday, November 2, 2018 in Toronto and Montreal.